Image caption The Chinese firm calls its vehicles "surfing electric scooters"
US marshals have raided a Chinese hoverboard-maker's stand at the CES tech show in Las Vegas. The officials confiscated all the company's one-wheeled vehicles and took down its signs after a Silicon Valley-based rival filed a patent infringement claim. The case is set to return to court in a week's time. The Chinese firm, Changzhou First International Trade, told the BBC it did not believe it had broken the law. 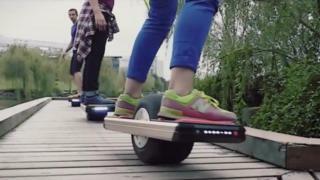 It claimed it had developed its hoverboard a long time ago and had hidden it until now to avoid it being copied by other Chinese firms. It added that this was the first time it had been involved in such an incident. A spokeswoman for the US Department of Justice told the BBC: "A court order has been served in a civil case involving private litigation." She added that while it was not uncommon for the US marshals to be involved in such action, she could not recall another case happening at a trade show. Footage of the incident has been posted online by the news agency Bloomberg. While there are many companies exhibiting hoverboards at CES, the Chinese firm's models - which it calls Surfing Electric Scooters - were unusual for having a single central wheel rather than one at each end. This is similar to California-based Future Motion's Onewheel vehicle, which uses sensors and computer controls to keep the board balanced. "We have design and utility patents that cover our invention," Future Motion's founder Kyle Doerksen told the BBC. "When we got word that a company was exhibiting a knock-off product, we engaged in the formal process, which involved sending a cease and desist letter and then getting a restraining order, which was then enforced by the US marshals. "As a company that launched ourselves at CES two years ago, we know that the world is watching. "And we knew that this was a situation where they could do real damage to our business if we just allowed them to violate our patents." Changzhou currently lists its device for $550 (£375) on the Alibaba shopping site, which is about a third of the price of the Onewheel. "Punitive measures could include a permanent injunction preventing Changzhou from selling the product in the US, monetary damages including lost profits we can prove due to infringing sales, and even attorney's fees if the court decides it's an exceptionally egregious case of wilful patent infringement," said Future Motion's lawyer Shawn Kolitch. He added that Future Motion had patents pending elsewhere including in China, which it hoped to obtain in order to stop Changzhou manufacturing the device. This is not the first controversy hoverboards have faced at CES. Ahead of the event starting, its organiser announced that attendees were banned from using any type of the vehicles to get about its showfloors. Dozens of universities and other institutions in the US had earlier banned their use and most of the country's airlines have also refused to carry them. They have been involved in incidents where people have been injured or killed when the rider lost control. And some of the gadgets have burst into flames as a result of problems with their batteries, leading to concerns that some manufacturers are not following safety standards. Read and watch more from CES and follow the BBC team covering the event on Twitter.